ANAHEIM, Calif. (AP) — Playing with a sore hand and a banged-up left leg, the Oakland Athletics‘ Jed Lowrie would be the first to confirm that winning ugly is way better than losing. Lowrie took no issue with a potential blowout turning into a nail-biter, a rare occurrence for Oakland’s bullpen. The A’s took the series against the Angels by winning the last two games. Oakland, which currently occupies the second AL wild-card spot, moved within 2 ½ games of first-place Houston in the AL West. The Astros have lost four straight. Oakland is now 36-12 over its last 48 games, the second-best record in baseball over that stretch, behind the Boston Red Sox. The A’s have taken 13 of their past 16 series. Lowrie doubled to left field in Oakland’s three-run first inning, giving him 1,000 hits over 11 seasons. It was also the 250th double of his career. 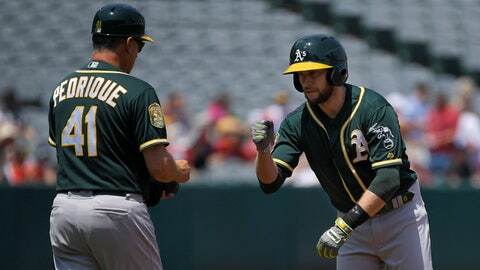 Lowrie’s 1001st career hit was his 18th homer this season, a two-run shot during a four-run fourth for the A’s. Marcus Semien had three hits for the A’s and reached base four times, a day after hitting a pair of home runs. Lowrie also had a walk as he reached base three times. Los Angeles trailed by as many as four but pulled within a run in the eighth inning on Shohei Ohtani’s two-run single off Jeurys Familia. Blake Treinen struck out the side in the ninth for his 30th save in 34 opportunities. A’s pitchers matched a season high with 16 strikeouts. A’s starter Trevor Cahill allowed four runs on seven hits with a walk over 4 2/3 innings. “I think it was the first game this year when I didn’t have my changeup, which has been kind of my go-to and my savoir, especially if the fastball command isn’t there,” Cahill said. Fernando Rodney (4-2) pitched a scoreless inning in relief to earn his first victory for the A’s. Rodney has two scoreless innings with Oakland after being acquired from the Minnesota Twins on Thursday. “The goal is pitching again this year and we feel that is attainable,” Scioscia said. Angels: LHP Tyler Skaggs (left adductor strain) returned to the 10-day disabled list following his rough outing Saturday, when he gave up seven runs on 10 hits over 3 1/3 innings against the A’s. … SS Andrelton Simmons was a late scratch from the lineup with left knee soreness and is day-to-day. … C Rene Rivera (arthroscopic knee surgery) was expected to play in a game at Single-A Inland Empire on Sunday and Monday, with the Angels hoping he can return to the active roster during the upcoming road trip to San Diego, Texas and Arizona. A’s: LHP Sean Manaea (10-8, 3.50 ERA) will take the mound Monday at home against the Seattle Mariners, having lasted just 2 2/3 innings in a start against the Los Angeles Dodgers last week.